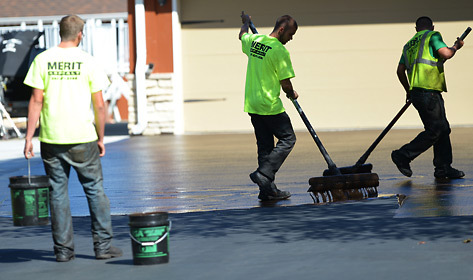 Merit Asphalt, Wisconsin Paving | Residential Paving | Project planning, excavation and grading, new asphalt, asphalt repair for driveways, patios, basketball courts, walking paths and more! More integrity per square foot than anyone in town. We understand that your home is more than just a place to live — it's an investment. Your driveway or walkway should be picture perfect, durable and long lasting, enhancing your property. Whether you're building a new home or refreshing your existing driveway, our experienced residential paving team can help plan and install pavement that complements the beauty of your home. Our state-of-the-art equipment and highly trained experts elevate every paving project to an art form, with a product that can be admired for years to come. 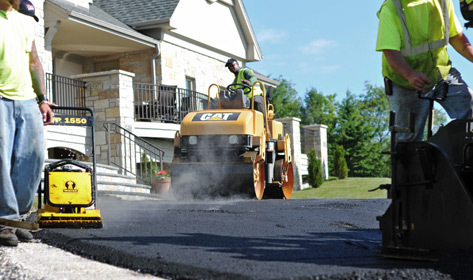 See for yourself why we're more than a residential paving contractor — we're your asphalt paving consultant. Call 1-262-679-3388 today or click here for your free quote. "Your company's handling of this job was most impressive from start to finish!" — David, Waterford, Wis.